Developer Name Raheja Developers Ltd. It is one of the most ambitious projects spread over verdant 108 acres lush green land with additional expansion of township over 200 acres. Through this project residents will get an opportunity to enjoy natures’ bounty for the site of the project adjoins Aravalli Hills. Location: Raheja Aranya City has been thoughtfully planned and placed in two sectors including sector 11 and Sector 14 in Sohna. Laid on Gurgaon-Alwar road, the project has smooth road connectivity. Residents here will be close to Delhi and Gurgaon but away from the congestion and pollution of the cities. KMP Corridor and Gurgaon’s residential sectors just at four kilometre and 12 kilometre’s distance further make it a preferable residential destination. Available choices: This integrated township has options to meet with diversified housing requirement of individual home buyers. Choices offered here include group housing condominiums, penthouses, luxury homes, villas and plots. Plots here range from 253 square yard to 822 square yard. Features: The entire infrastructure of Raheja Aranya City will be developed by Larsen and Toubro (L&T) a well known construction company. This will be a one stop solution where one can lead comfortable life and can find almost everything at his or her doorstep. This township will also include schools, malls, commercial spaces, hospitals and local SCO markets. Current Status: The project has been launched. 1. Stamp Duty/Registration Charges shall be payable along with last installment based on the prevailing rate. 2. PLC shall be payable as per demand . 4. All cheques/Drafts are to be made in favour of “RAHEJA DEVELOPERS LIMITED”, Payable at Delhi/New Delhi. 5. Prices subject to revision at the sole discretion of the company. Aranya in Sanskrit means “forest” or “wilderness” and represents our vision to provide you with your own piece of Heaven on Earth. In our fast paced lives, we sometimes forget our place in Gods creation. Spread over 107.85 acres of land and additional expansion of upto 250 acres abutting several thousand acres of forest and the Aravalli ranges , the township will be well equipped to fulfill every need of its discerning buyers. Group housing condominiums, penthouses, designer homes, villas and plots will form core of the development in a harmonious blend with social infrastructure comprising schools, hospitals, nursing homes, shopping arcades and adequate open greens. Landscaped areas, water bodies, swimming pools and healthcare facilities will adorn the city. Raheja’s Aranya -The Green City, Sohna which is just 12 kms* from Gurgaon residential sectors and 4 kms* from KMPCorridor. At Aranya you remain close to Delhi and Gurgaon, while being away from their pollution and congestion. Spread over 107.85 acres of land. Plots are being offered in various sizes to suit all requirements. Plots ranging from 349 Sq. Yards to 822 Sq Yards. Club, Swimming Pool, Spa, Steam Sauna, Jacuzzi, Gymnasium. Free – hold plots are available at approximately less than one fourth the plot rates on Golf Course Extension Road (approximately 14 kms away) and less than approximately one third the plot rates on Southern Periphery Road (approximately 13 km away). 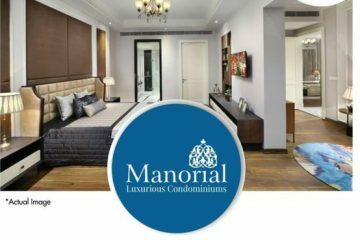 Ideal for those looking for owning their own piece of land in Gurgaon to build a custom designed dream house, not too far from their work-place in Gurgaon. Also an excellent opportunity for both Investors end users to own their own peice of Gurgaon in a secured community. 2. Aranya in Sanskrit means “forest” or “wilderness” and represents our vision to provide you with your own piece of Heaven on Earth. In our fast paced lives, we sometimes forget our place in Gods creation. When was the last time you woke up to the calls of peacocks and other exotic birds ? When was the last time you went for a nature walk surrounded by natural sulfur springs and heritage architecture? When was the last time you looked up at the night sky, gazed at the plethora of Stars andGalaxies, andwondered,arewethe onlyonesout here? When was the last time you inhaled the freshness of morning dew dripping from wild fragrant flowers? Whenwasthe lasttimeyoufelt alive? 3. *Approx. Distance Raheja’s Aranya -The Green City, Sohna is one of the most prestigious and ambitious projects of the company. This mega city will be a completely integrated township with all the facilities one needs and aspires to enjoy a comfortable life-style. Spread over 107.85 acres of land and additional expansion of township over 200 acres abutting several thousand acres of forests and the Aravalli ranges, the township will be well equipped to fulfill every need of its discerning buyers. Group housing condominiums, penthouses, designer homes, villas and plots will form core of the development in a harmonious blend with social infrastructure comprising schools, hospitals, nursing homes, shopping arcades and adequate open greens. Landscaped areas, water bodies, swimming pools and health-care facilities will adorn the city. 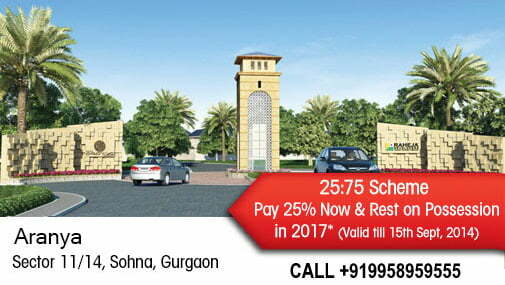 Raheja’s Aranya -The Green City, Sohna is just 12 kms* from Gurgaon residential sectors and 4 kms* from KMPCorridor. AtAranya youremainclosetoDelhi andGurgaon, while being away fromtheir pollutionandcongestion. 4. • Located on the Gurgaon A l w a r R o a d e a s i l y approachable from the KMP Expressway (4kmsaway) • Just a comfortable 20 minutes drive approx. from Gurgaon on the super smooth Gurgaon – SohnaRoad. • IMT-Sohna and upcoming sports city in the vicinity of the township • Accessibility and connectivity are huge pluses for the project whose residents will be able to commute comfortably and conveniently to nearby Gurgaon. 5. Aravalli ranges near Raheja’s Aranya CityAravalli ranges near Raheja’s Aranya City Be one with nature at Raheja’s Aranya -The Green City. Every facet of the township is sheer symphony with nature’s bounty, be it the never ending Aravalli facing views or the amazing landscape of greenery and vast open spaces. 6. 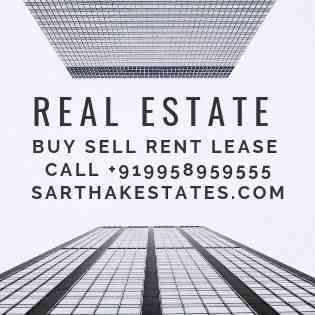 THE ENVIRONS Being located on the super smooth Gurgaon – Sohna Road is a major plus in terms ofconnectivityandaccessibilityforRaheja’sAranya -TheGreen City,Sohna. The entire site is Aravali facing, abounding in plenty of green areas at the existing location. The major growth corridor of the area – the upcoming KMPExpressway, is located very close to the site. The Expressway is at an advanced stage of construction and shallsoonbe operational. Haryana Government’s much anticipated mega project – The Sportscity, is being developed very close to the site, as is the upcoming state of the art industrial estate ofIMTSohna. Actual photograph of the existing industrial estate, flanked by upcoming IMT Sohna. Actual photograph of the KMP expressway, nearing completion, close to the Raheja Aranya City Site. Actual photograph of the Gurgaon – Sohna expressway. 7. 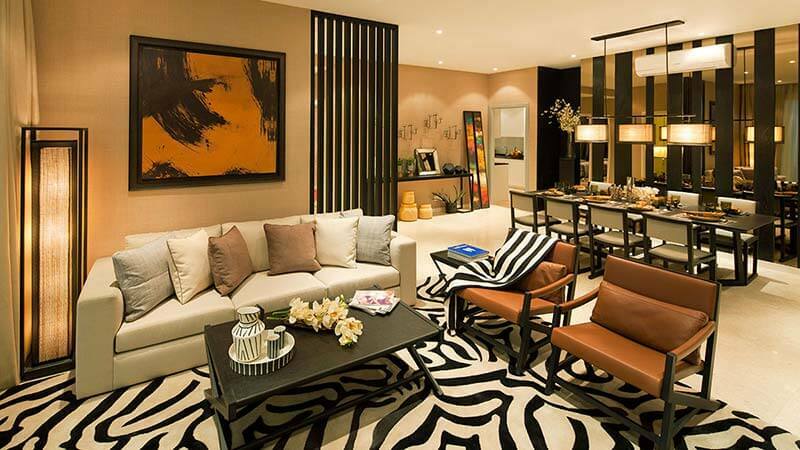 The exquisitely crafted designer homes & villas at Raheja Aranya -The Green City are a conneiseur’s delight. Fully loaded with imported floorings & kitchen, private lap pool, natural wooden floorings, air-conditioning, imported sanitaryware, & glass railings, these uber residences are meant only for the chosenfew. LIFESTYLE HOMES.. It is the dream of many to own their own piece of earth. However, not many have the good fortune to realise it within their lifetime. Raheja Aranya -The Green City provides you the opportunity of a lifetime of owning plot sizes from 193 sq yards to 822 sq yards close to Gurgaon. Come,and make your dreams come true !! Our parents have always been our inspiration, our idols, our mentors. Remember the first step you took, the first word you spoke, the first time you went to school, the first time you learnt to ride a cycle. Our parents have always been our guiding lights. In the twilight years of their lives, Raheja’s Aranya -The Green City is your way of reciprocating all the love & affection they bestowed on you, by gifting them an oasis of peace & serenity, in an exclusive gated environment where your family spends the weekend together. The township is a self sustainable and secure community surrounded by all the necessary conveniences like a medical center,health Programs,shopping etc. Away to tell them,that YOU CARE. 9. A PREMIUM GROUP HOUSING IN RAHEJA’S ARANYA – THE GREEN CITY And for those looking at apartment living, with lesser hassles of self building and maintenance, there will be options to keep an apartment under micromanagement. 10. The retail centre atAranya -The Green City shall be a one stop destination for your weekend shopping and entertainment needs with a collection of all lifestyle brands and entertainment options under a single roof, being completely mindful of the fact that you would not like to travel far away from your residence for your shopping needs. 11. Health and education are core social infrastructure requirements & we are extremely aware of this fact. That’s the reason why only the best names in health and education shall be announcing their arrival at Raheja Aranya -The Green City. A world class school, hospital and nursing homes shall make feel completely at ease at the township. 12. RELAX AND DE-STRESS AFTER A HARD DAY The club – house at Raheja’s Aranya -The Green City comes studded with all the delights you desire, from the exotic spa, the soothing steam sauna, state of the art tennis and basketball courts, gymnasium, refreshing jacuzzi, as well as aerobics centre aimed at ensuring a healthy body and mind for you and your near and dear ones.Addto that, the sulphurwatersofSohnaSpringsto treat anddetoxyourbody. 17. RAHEJA DEVELOPERS has been recognized on several International and National platforms and conferred with prestigious awards such as CNBC AWAAZ-CRISIL Real Estate Awards, Cityscape Asia Awards, Asia Pacific Bloomberg Google Property Awards, OPP (London) Excellence Awards, Zee Business RICS Award and the Golden Peacock Award for Innovation Management. Raheja was also awarded the internationally acclaimed Euromoney award for the Best Developer in India & the OPP Awardforthe BestDeveloperWorldwide.